A prolific NASA orbiter has celebrated its fifth year at Mars this month and the spacecraft has no plans to slow down anytime soon. NASA's powerful Mars Reconnaissance Orbiter began circling Mars on March 10, 2006. The primary science phase of the probe's mission wrapped up in 2008, but MRO keeps plugging away, monitoring the Martian surface in great detail and serving as a communications link between landers and rovers and scientists on Earth. MRO has radically expanded scientists' understanding of Mars, providing copious information about the Red Planet's environment and how it has changed over time, researchers said. "Copious" may be an understatement — the probe has transmitted more data to Earth than all other interplanetary missions combined. And the spacecraft's continued operation will only add to researchers' growing knowledge base. "Each Mars year is unique, and additional coverage gives us a better chance to understand the nature of changes in the atmosphere and on the surface," MRO project scientist Rich Zurek, of NASA's Jet Propulsion Laboratory in Pasadena, Calif., said in a statement. "We have already learned that Mars is a more dynamic and diverse planet than what we knew five years ago. We continue to see new things." MRO launched in August 2005. After seven months of interplanetary flight, the spacecraft fired its six main engines for nearly 27 minutes as it approached Mars on March 10, 2006. Mars could not capture the probe into orbit without this critically timed maneuver, which slowed MRO down. The orbiter's intended path took it behind Mars, out of communication, during most of the engine burn. And that made some of the MRO team nervous. "That was tense, waiting until the spacecraft came back out from behind Mars and we had contact," said Dan Johnston, now the mission's deputy project manager at JPL. But everything worked out just fine, and MRO began making observations of Mars as part of its two-year primary science phase. The mission met all of the science goals laid out for this phase, and two extensions — the latest beginning last year — have kept the data rolling in. And it's a lot of data. MRO has transmitted more information to Earth than all other interplanetary missions combined, researchers said. The tally is 131 terabits and counting, including more than 70,000 images. The MRO mission has illuminated three very different periods of Martian history, researchers said. The spacecraft's observations of the planet's oldest terrain, for example, reveal minerals that formed in the presence of water — helping show the prevalence and diversity of watery environments on ancient Mars. MRO has also shown that, in the more recent past, water appears to have cycled as a gas between polar ice deposits and lower-latitude reservoirs of ice and snow. These processes likely took hundreds of thousands or millions of years, researchers said. And like ice ages on Earth, they could be linked to cyclic changes in the tilt of Mars' rotation axis and the changing intensity of sunlight near the poles. 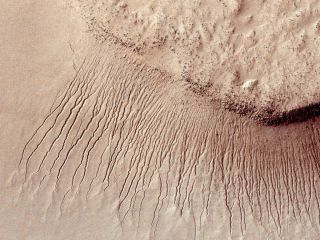 Mars' present climate is also dynamic, with volatile carbon dioxide and— possibly — summertime liquid water creating some gullies and modifying others. With observations of new craters, avalanches and dust storms, MRO has shown a world that is partially frozen, but not frozen in time — change continues today. In addition to its science observations, MRO provides support for other spacecraft as they land and operate on the Martian surface. For example, the orbiter's cameras captured the Phoenix Mars Lander as it parachuted to the surface in 2008, researchers said. MRO also monitored the atmosphere for dust storms that could affect Phoenix and NASA's Mars rovers Spirit and Opportunity. And the probe — along with NASA's Mars Odyssey spacecraft — has served as a communications link between those missions and Earth. In addition, MRO has examined potential landing sites for NASA's Mars Science Laboratory mission, which will land a rover named Curiosity at one of those spots in August 2012. How much is 100 terabits? This graphic compares the 100 terabits of data collected by NASA's Mars Reconnaissance Orbiter with other data storage mediums commonly used on Earth. MRO's Mars Color Imager instrument has produced more than four Earth years of daily global weather maps, researchers said. The orbiter's High Resolution Imaging Science Experiment (HiRise) camera —which can resolve surface features as small as a coffee table — has snapped more than 18,500 images that, combined, cover about as much territory as Alaska. Another MRO instrument, the Context Camera, has taken more than 36,900 photos, covering nearly two-thirds of the Martian surface at a resolution that allows detection of features the size of large buildings. An MRO spectrometer has mapped minerals on more than three-fourths of the planet's surface, and another instrument has taken more than 59 million readings of atmospheric conditions, including temperature, researchers said. And it looks like the orbiter will continue gathering data well into the future. "The spacecraft is still in excellent health," Varghese said. "After five years at Mars, it continues with dual capabilities for conducting science observations, monitoring the Mars environment and serving as a relay."